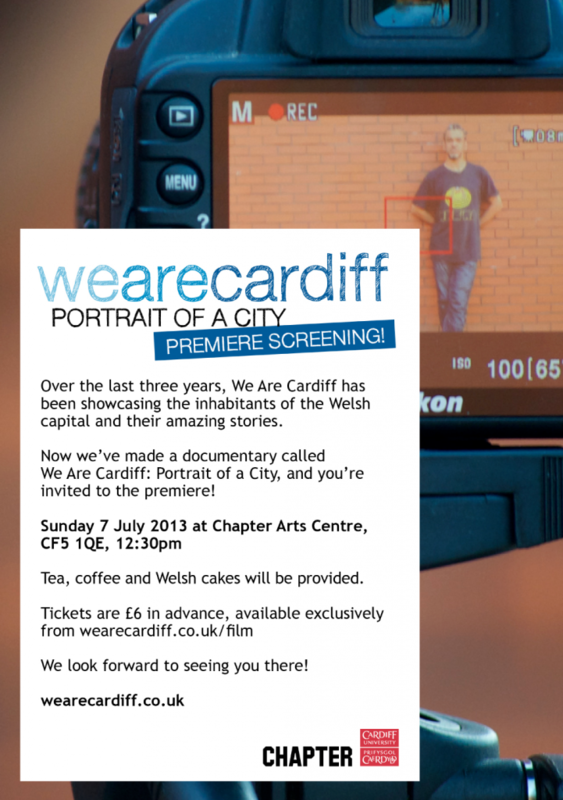 We Are Cardiff invite you to the premiere screening of “We Are Cardiff: Portrait of a City” at the Chapter Arts Centre on Sunday the 7th of July. Helia Phoenix told us a little bit about the project, “As you may or may not know, we’ve been working on making a film for nearly a year and a half now. The day has come for the beast to be unleashed! There’s a launch screening party at Chapter Arts Centre on Sunday 7th July at 12:30pm (lunchtime), and we’d really really love to see you there. Tickets are available for the very reasonable price of £6 and there will coffee, tea and Welshcakes! You can read more about the event on Facebook or on the We Are Cardiff website. We are a Spanish and an Italian qualified native teachers from Florence and Barcelona offering lessons in Cardiff city centre. Thanks, and congratulations for your blog!